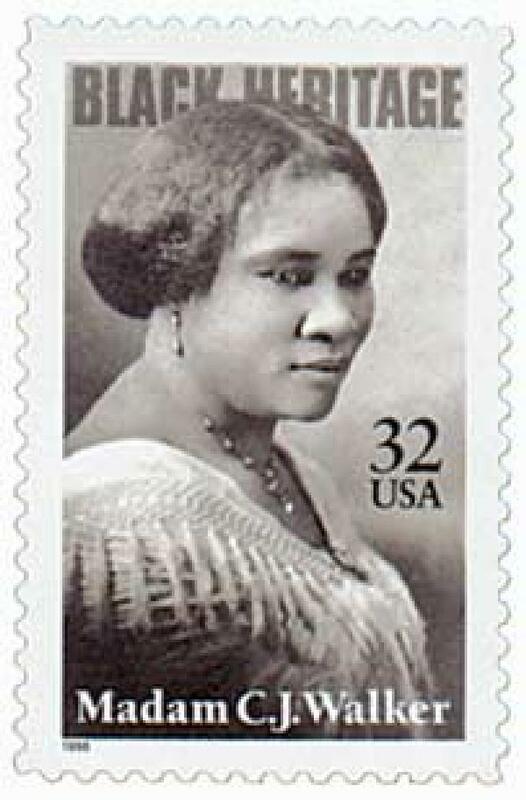 U.S. #3181 – Walker was the 21st honoree in the Black Heritage series. Sarah Breedlove, better known as Madam C.J. Walker, was born on December 23, 1867, in Delta, Louisiana. Breedlove was one of six children born to Louisiana sharecroppers and the first one to be born free after the Emancipation Proclamation was signed. Both of her parents died by the time she was seven years old, leading the orphan to move to Vicksburg, Mississippi, where she became a domestic worker. Breedlove married when she was 14, possibly to escape an abusive brother-in-law. By the time she was 20, her husband died and she was raising a two-year-old daughter on her own. She would marry two more times in her life. In 1888, Breedlove moved to Saint Louis, Missouri, where she worked as a laundress. She only made a dollar a day but was committed to making more so she could afford to give her daughter a formal education. She also wanted a better education for herself. 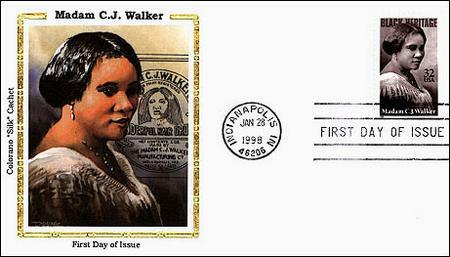 U.S. #3181 – Walker Silk Cachet First Day Cover. Breedlove’s interest in hair tonic began in the 1890s when she lost her hair trying to treat a scalp problem. Breedlove learned a bit about hair care from her brothers who were barbers. Then around 1904 she began selling African American hair care products for Annie Turnbo Malone. Through experimentation with homemade remedies, she invented Madam Walker’s Wonderful Hair Grower – a scalp conditioning and healing tonic. Breedlove married Charles Joseph Walker in 1906 and he became her business partner, offering advice on advertising and promotion. Breedlove then adopted the name Madam C.J. Walker and began selling her products door-to-door, showing women first hand how to take care of their hair. That same year, she placed her daughter in charge of a mail order business to send out the products while she and her husband traveled the country to promote it. U.S. #3181 – Mystic First Day Cover. Over the next few years, Walker opened parlors and factories in Pittsburgh, New York City, and Indianapolis. She went on to develop cosmetics along with other hair-care products and hired “agents” to sell these door to door. Her manufacturing company grew to employ over 3,000 workers, with many women in management positions. By 1917, Walker’s company was the largest African American-owned business in the United States and claimed to have trained almost 20,000 women. She took great pride in providing employment to African American women at a rate of $5 to $15 a day, when many white laborers were earning just $11 a week elsewhere. The popularity of her products eventually spread and they were sold in the Caribbean, Cuba, Jamaica, Haiti, Panama, and Costa Rica. U.S. #3181 – Classic First Day Cover. 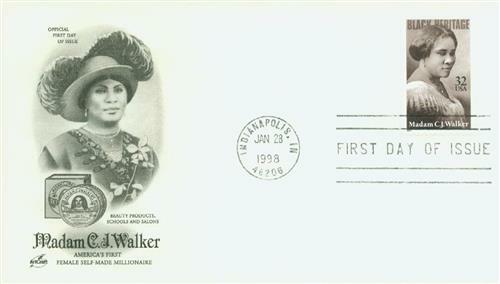 Over the years, Madam Walker established beauty schools and funded scholarships. She gave generously to the NAACP, the black YMCA, and homes for the aged, and funded a scholarship for women at Tuskegee Institute. In fact, two-thirds of her estate was left to educational and charitable institutions. Walker died on May 25, 1919, in Irvington, New York. She was later recognized by the Guinness Book of World Records as the first female self-made millionaire in America. Click here to view a website dedicated to Walker’s life and legacy. Christmas Favorites from the Past Decade – get 23 Christmas stamps and save $3.45. 5 Responses to "This Day in History… December 23, 1867"
Fascinating how this young woman rose above her environment and station in life through sheer determination and self will. Its a shame she died at such an early age (only 52). An inspiring success story from the black community of over 100 years ago . 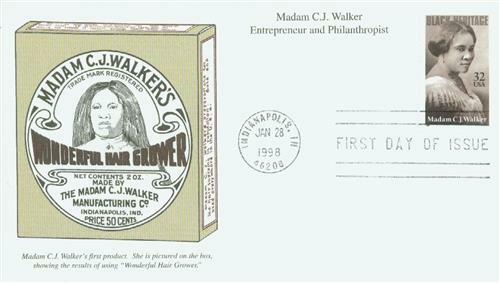 Using Google, I found out that her name was reintroduced to the market in March 2016 as Madam C J Walker Beauty Culture product line under Sundial Brands which in November 2017 became part of Unilever. So her brand name is back. A beautiful way to highliight history, As a former high school history teacher it’s always refreshing to read these notes on people and events that have contributed to our nations history.